If You Can’t #BeBest, #BeOriginal…Are We #Winning? Freelancers need protection too, writes Elisabet Cantenys in Open Society Foundations. Freelancers are especially vulnerable as their next job depends on their reputation…EVERY…SINGLE…TIME. Justin Trudeau and a host of Canadian leaders call out social media platforms to discuss the online harassment experiences of women leaders, particularly’s Alberta Premier @RachelNotley who has received death threats via social media. 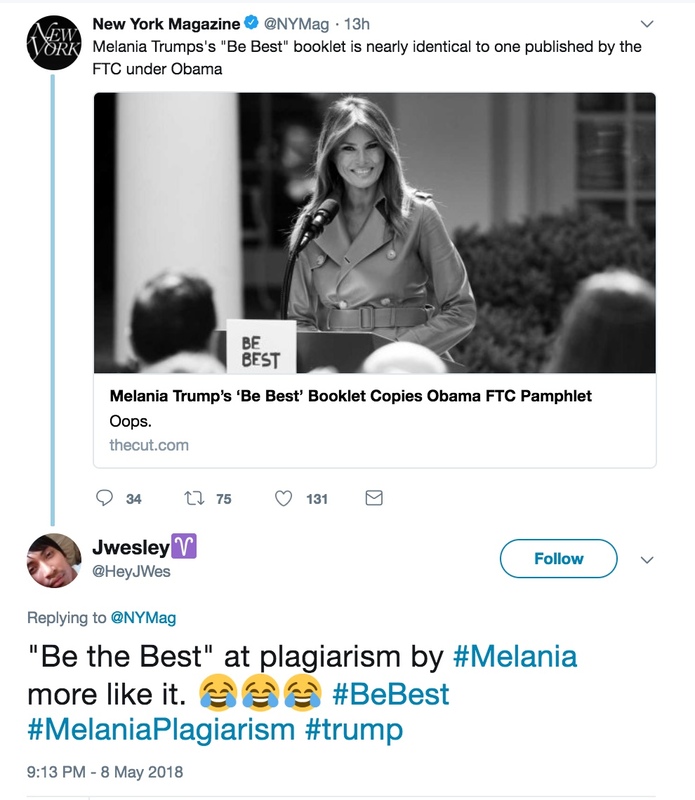 U.S. First Lady Melania Trump officially launched her Be Best cyberbullying campaign on Monday, saying “Together, I believe we should strive to provide kids with the tools they need to cultivate their social and emotional health.” She quickly got dragged on Twitter for plagiarism for having cannibalized an Obama-era online safety campaign booklet as the New York Times reports. #Sad. Groundviews is running a long-form series on online harassment and its chilling effect on women in politics. The student government president at American University is suing Andrew Anglin of neo-Nazi website The Daily Stormer for coordinating a troll storm against her on social media, The Washington Post reports. Instagram has added a filter it says will help combat harassment on its platform. Wired writes about the complexity and promise of detecting online hate speech with artificial intelligence. Next week, founder of TrollBusters Michelle Ferrier will speak on a panel at RightsCon Toronto. The “Take Back the Net: Innovations in Tackling Online Hate and Harassment” session will highlight organizations battling the chilling effect online harassment has on journalists, women, people of color and others. The panelists will discuss efforts to solve online abuse, even as tech companies struggle to find solutions. Check out all the themes of RightsCon Toronto from May 16-18. Ferrier will be sharing work that is building on the gap analysis developed at the Internet Freedom Festival in March 2018. According to the United Nations, World Press Freedom Day is a day to celebrate the fundamental principles of press freedom, assess the state of press freedom throughout the world, defend the media from attacks on their independence and pay tribute to journalists who have lost their lives in their line of duty. #WPFD, on May 3, 2018 inspired and informed us. Here are our top ten tweets from this year’s campaigns for safety and freedom of expression. And below, our nine favorite tweets of #WPFD that help describe the deadly issues of press freedoms and the new states of media oppression growing in the United States and around the globe. We especially call out the work of Nighat Dad and Digital Rights Pakistan in providing safety for women journalists. What can you do today to make yourself safer online and off? Clean up your digital footprint with our 16-lesson Digital Hygiene Course. Check out these and other lessons at Troll-Busters.org.